Sean Dyche may not have the biggest budget in the Premier League. But what he and the club can offer players, apart from the obvious - Premier League football - is there for all to see. Dyche’s first steps on the coaching and management ladder were at Watford with the youth team, and that desire to develop and improve remains. And for players looking to further their careers, Turf Moor is proving the ideal place. In Dyche’s five years at the helm, the number of international players at the club has grown exponentially. After waiting 42 years for a full England international, Tom Heaton, Michael Keane and Jack Cork have been capped in the last 18 months, while players who worked with Dyche at Turf Moor, Danny Ings and Kieran Trippier, have pulled on the Three Lions since moving on to Liverpool and Spurs respectively. Sam Vokes is a regular for Wales, scoring the killer goal to beat Belgium in the Euro 2016 quarter-finals, while Stephen Ward, Jeff Hendrick, Robbie Brady, Kevin Long and Jon Walters are all part of Martin O’Neill’s Republic of Ireland squad who saw their World Cup dreams denied on Tuesday night, and New Zealand captain Chris Wood is travelling back from Peru after the All Whites’ play-off defeat. 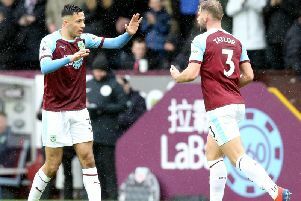 Iceland’s Johann Berg Gudmundsson and Steven Defour of Belgium could become the first Clarets at a World Cup since Billy Hamilton and Tommy Cassidy with Northern Ireland in 1982. And you can add Scott Arfield, a current Canada international, while Phil Bardsley (Scotland), Anders Lindegaard (Denmark) and Nahki Wells (Bermuda) are all full internationals as well. And Dyche said: “The development side of what we’ve done year on year has been pretty obvious. ”Players have developed and improve. “I hope there’s some thought out there that this is what we do. ”Within that, if Corky’s a good show of that, then great. “I think we’ve rubbed off on a few, I read a thing with Tripps the other day, who had nice words about his time here and working with the staff. It’s good to hear they’ve taken something from us with them. “If me or my staff can help a player, then that is a massive thing for me, and that will be with me as long as anything in the game. “Corky is a good sign of that, he has come in open minded. ”It’s a different way of playing, a different challenge, and he’s adapted almost seamlessly and delivered some very, very high level performances, in a team that don’t always have it easy. ”He’s prepared to do that, he can play but he can do the ugly side as well and work and grind and tackle. “He should be very proud of himself and his family should be very proud of him.